I recently discovered the work of Bristol-based ceramic designer-maker Hanne Rysgaard and was immediately taken by her floral-inspired milk jugs. They're just so quirky and would look perfect adorning a breakfast table...and would, I'm sure, be a talking point. Based on 'fun and function', they're available in a variety of different patterns and sizes. Hanne designs and makes her ceramics in a studio called Blaze, which is located in Bristol's historic Christmas Steps Arts Quarter. Her personal approach to life is 'you have to smile' and her work focuses on fun and function. It's both useful and pleasurable in equal measures. 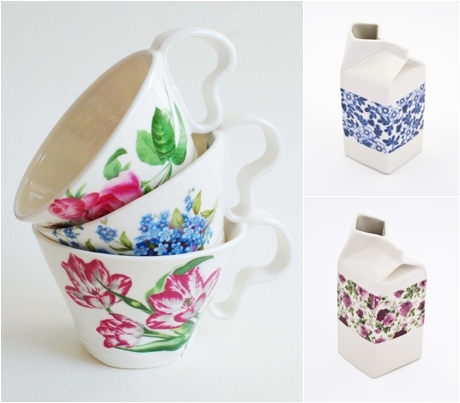 As well as floral-inspired milk jugs, Hanne also has a range of beautiful tea cups. Plus a large plate, known as a charger, and a teapot, with a fun mix of flowers and butterflies. Here's an image of Hanne at work in her studio. So, I hope you've enjoyed seeing Hanne's designs today. If you'd like to see more of her ceramics, do pop over to her website. And if you'd like to keep up-to-date with her news, she's on Twitter and Facebook, plus has a blog.